Laughably-Easy Lard (or Bacon Fat) Pastry Crust | Have YOU Ben Starr Struck? The perfect pastry crust eludes most of us…seemingly thousands of infinitely-thin layers that are tender, but shatter in your mouth while still remaining moist and succulent. It usually involves massive amounts of butter cut into the flour at just the right temperature to just the right texture…then a chill in the fridge…then the addition of just the right amount of ice-cold water, then just the right amount of careful working of the dough…interspersed with just the right amount of chilling in the fridge again…until finally the dough is perfect. But then it needs another chill in the fridge, followed by just the right amount of time on the countertop for it to be pliable enough to roll out, followed by JUST the right touch so you don’t overwork the gluten as you roll it out. It’s exhausting, quite frankly. But there’s no real alternative…right? 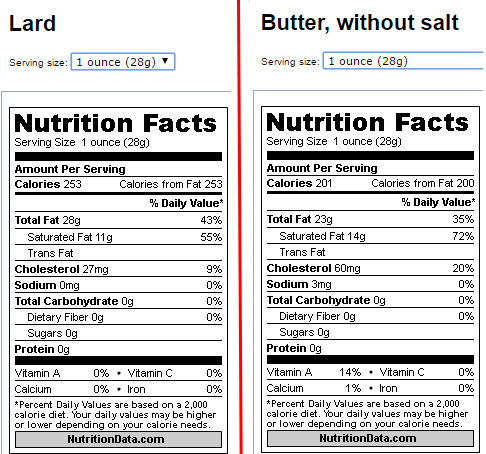 Lard has LESS saturated fat and LESS cholesterol than butter, ounce for ounce. This chart shows that, ounce for ounce, lard DOES have more fat and calories than butter…HOWEVER, in an ounce of lard, there are 3 grams LESS of saturated fat, and half the cholesterol of butter. And those are typically the 2 things your doctor would like you to decrease in your diet. Also, lard has a pretty high smoke point…375F…much higher than butter. Meaning you can sear or fry in it, whereas you can’t with butter without burning it. So let’s permanently put aside this irrational fear we have of lard, and embrace it as a superior cooking fat. I’m not saying to replace your healthy olive oil with lard. 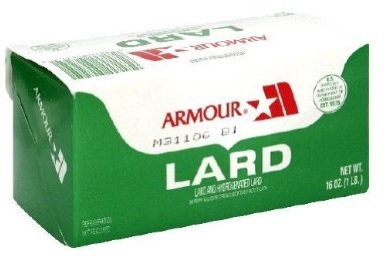 But on special occasions, lard will deliver a superior product to butter, and still be a bit healthier for you! Now…where the heck do you get it? Gross! Do not EVER buy lard from the grocery store. It’s poison. In addition, commercially produced lards contain BHA (butylated hydroxyanisole…I can’t pronounce it either) to prevent them from going rancid as they sit on the shelf for months. BHA is suspected to be a human carcinogen by the National Institutes of Health. Freshly-rendered lard sold at virtually ever decent Latin American market. Real, freshly-rendered lard is actually pretty easy (and cheap…$2-$3/lb) to find all over the US, though that wasn’t the case a decade or two ago. Your local Latin American market has been rendering lard to make chicharones (ie “pork rinds”) since the day they opened, and they sell it right there next to the chicharones in quart-size deli cups. It will be in the deli section where they sell pre-prepared foods like tamales and carnitas. Ask for “manteca fresca” if you can’t find it. 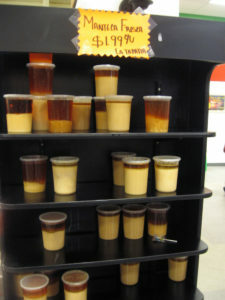 This lard is freshly-rendered and may be entirely liquid, or a soupy solid, depending on the pig’s diet, the ambient temperature of the store, etc. Because it’s fresh, it’s subject to going rancid (like ANY fat or vegetable oil), so keep it in your fridge and use it as quickly as you can. Light and oxygen are its enemies. This fresh lard has a mild “porky” flavor to it. Certainly, for savory crusts like for quiches or meat pies, there’s just nothing better. (Except for bacon fat…read on.) An apple pie with a fresh lard crust is to die for. However, a delicate lemon cream pie might not agree as well with a fresh lard crust. There’s another type of lard that is highly coveted by pastry chefs, and it’s called “leaf lard.” It’s rendered from the fat around the kidneys, which is pure and white and fully solid at room temperature…but with a soft-delicate texture, just a bit sturdier than room temp butter. It is flavorless, and any pastry chef on the planet will tell you that there’s simply no better fat for making everything from sweet pastries to croissants. It beats out butter every single time. 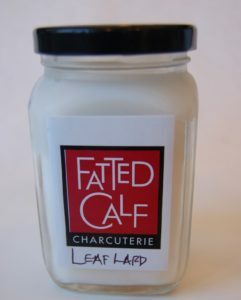 You’ll find leaf lard at gourmet and specialty markets, or you can order it online everywhere from Etsy to Amazon. Expect to pay anywhere from $6/lb to over $30/lb depending on the source and the farm that raised it. If you want leaf lard from Berkshire pigs raised in a pasture and fed only walnuts, flowers, and beer…you can find it, but you’ll pay for it. I’ve only bought leaf lard a few times in my life. If I need a pastry with a delicately flavored crust and the flavor of fresh lard just won’t do, I just use butter. Congrats to those of you who waded through that 1000-word rant on the wonders of lard. I shall reward you with a recipe you’ll have memorized by the second or third time you use it, and you’ll use it often, it’s so easy. Plus, it contains only a fraction of the amount of butter called for in an equivalent butter-based pastry crust, meaning far less overall stuff that’s bad for you. You’ll note that this recipe is in weights (ounces) rather than volume (cups.) If you’re REALLY after fast and easy baking with fewer dishes to wash, get yourself a kitchen scale. You’ll thank me. You’ll also notice (strangely) that the lard called for in this recipe is liquid. Trust me on this one. Microwave your lard for a few seconds until it’s liquid, or place the lard container in a bowl of hot water until you can pour it. You’ll also notice this recipe calls for buttermilk (also highly unusual for pastry crusts), but if you follow me, you know how obsessed I am with buttermilk. It’s indispensable in this recipe, and there are no substitutes for it…other than perhaps sour cream or yogurt diluted with a little milk. If you don’t have buttermilk in your fridge, sit down and read that link above. NOTHING in your life is as important at this moment as educating yourself about buttermilk, I don’t care how fast you need to get this pie baked. Then go to the store and buy yourself some. Your friends and family will forgive you the lost hour, because your cooking will be that much better moving forward. There are 2 variations on this recipe, depending on whether you’re making a sweet pastry crust for a dessert, or a savory pastry crust for a quiche or a meat pie. The 4 base ingredients (flour, salt, lard, buttermilk) are the same for both recipes, but the other ingredients change. 4 oz buttermilk (1/2 cup) NO SUBSTITUTIONS. If you don’t have buttermilk in your fridge, shame on you. Turn the dough out onto a lightly floured surface. Working gently, pat the dough out into a flat disc. Fold the disc in half, then pat it out again. Repeat this for a total of 8 times. Then you can roll the crust out on a heavily floured surface to make into a pie. This entry was posted in Blog, Desserts, Main Courses, Recipes, Side Dishes and tagged bacon, bacon fat, Butter, crust, easy, hand pie, is lard better than butter, lard, meat pie, pastry, pie, pot pie. Bookmark the permalink. Ouch. I have lard. Real lard. I have bacon fat – or rather I have fat from slowly frying cvarci (pork rinds) the other day. I even have the clean white lard from around the pig’s kidneys in the freezer because I live in former Yugoslavia and even though I don’t raise pigs every relative living in a village does and they always have more lard than they need and they give it away. But ouch! I have no buttermilk. Nobody sells it here. They do sell kefir made from cow’s milk. Would that do as a substitute? Above you said that lard should be liquid or semi liquid at room temperature or else it is hydrogenated, well I live on a farm and I recently made pig lard, we raised the pig ourselves and it was free range the whole time, and our lard turned semi solid and white just like margarine.we rendered it by putting the fat on low heat then straining the craklins out and put it into mason jars.Do you know why it turned out that way, or if we did something wrong ? Elias, you did nothing wrong. The lard you normally get from the Mexican markets is a semi-solid, normally, at room temp, but the pig’s diet and age also contribute to the quality of the lard. You had a great pig!! Someday I’ll sample it from your kitchen, but the only time I used rendered lard (from making chicharrones), I made a bechamel sauce for some pasta. Delicious, but incredibly heavy.